Yunier Dorticos vs. Dmitry Kudryashov this Sat. 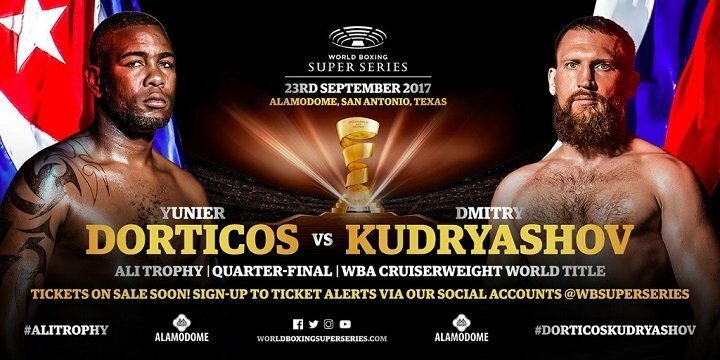 World Boxing Super Series action will hit the United States for the first time this week as the Yunier Dorticos vs. Dmitry Kudryashov quarter-final showdown lights up the ring this Saturday, September 23 from the Alamodome in San Antonio. This will be the third straight week of WBSS quarter-final action after Callum Smith impressively got the super middleweight tournament underway by dropping and beating previously unbeaten Erik Skoglund Saturday in Liverpool. The tournament kicked-off in spectacular fashion one week prior to that with unbeaten star Oleksandr Usyk delivering a TKO victory Marco Huck in Germany in the first cruiserweight quarter-final. Perhaps the most anticipated fight of the quarter-finals, Saturday’s main event pits the WBA champion Dorticos against the Russian knockout artist Kudryashov. The two men have combined for 41 knockouts over their 42 pro victories and will each look to emphatically punch their ticket to the WBSS semi-finals. The Dorticos vs. Kudryashov winner will face the winner of the quarter-final matchup between IBF champion Murat Gassiev and former champion Krzysztof Wlodarczyk that was recently announced for Oct. 21 in New Jersey. With a shot at title unification on the line, the stakes are sky high as the competitors vie to be the fighter left holding the Muhammad Ali Trophy next year. Fans in the U.S. can stream the WBSS action live by signing up at WorldBoxingSuperSeries.com on fight night. Make sure to follow the WBSS on all of your social platforms for updates from fight week and fight night. The September 23 event will also feature a reserve match between once-beaten cruiserweights Keith Tapia and Lateef Kayode, while former world champion Nonito Donaire returns to take on Mexico’s Ruben Garcia Hernandez. Boxing » Press News » Yunier Dorticos vs. Dmitry Kudryashov this Sat.